This weekend marks the beginning of Advent; traditionally the ‘waiting’ and preparation for the Christmas season. Of course in our overly-commercialised world, it’s the time most of us are bombarded by TV adverts for Christmas gifts; pressurised by children for the latest gadgets and gizmos; and rushing round manically to get everything in place for the perfect Christmas. But Christmas for some isn’t a happy or joyful time, and it’s an opportune time to consider those for whom this season is lonely or costly, or both. 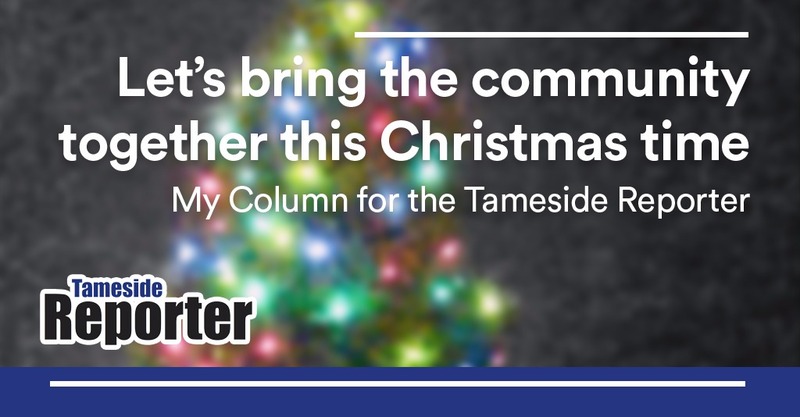 That’s why I’m always so proud to see some of the fantastic work that goes on across Tameside to try and bring the community together at this time of year. Like those dedicated volunteers at the St Mary’s Foodbank in Haughton Green. Now they give their time up freely all year round, but I know they are especially busy in the run-up to Christmas to ensure that everyone who needs their support, gets it. Food poverty is a real scourge on modern society. I want to live in a country where nobody needs food handouts, and where food banks aren’t needed. It frankly says a lot about Britain in 2018 that we still don’t pay people a real living wage so that they can actually feed and shelter their families. But the reality is we DO need food banks and I really sincerely thank those who volunteer to keep these groups running. I mention St Mary’s (and there are many others across Tameside) because they ensure there’s a Christmas Dinner (and selection boxes for the children) for every local family who needs one. So if you can donate something to a local food bank – please do! Likewise, every year we have toy appeals like the Samaritans Shoebox appeal. Again, a big thank you to all the volunteers who make this initiative so successful, meaning Santa gets to many more children than he might ordinarily. Again, if you can donate something, that’s brilliant. There are places you can donate all over Tameside, including in some council buildings. And lastly, let’s share a thought for people who find this time of year lonely or difficult. Drop in on a friend or neighbour and check they’re ok. Age UK offer support for those who are elderly and on their own; the Samaritans, for those who are in crisis and Citizens’ Advice for those worried about debt and financial hardship. And let’s vow to make 2019 a fairer, better society for all citizens.